Plentiful sunshine. High 92F. Winds SSW at 5 to 10 mph.. This tower at the corner of Madrona and Hudson avenues is for the power line that extend over Spring Mountain from Santa Rosa to St. Helena. The line goes from Madrona and Riesling to Madrona and Hudson, south on Hudson, east on Spring. It used to end at the substation on Mitchell and Oak. 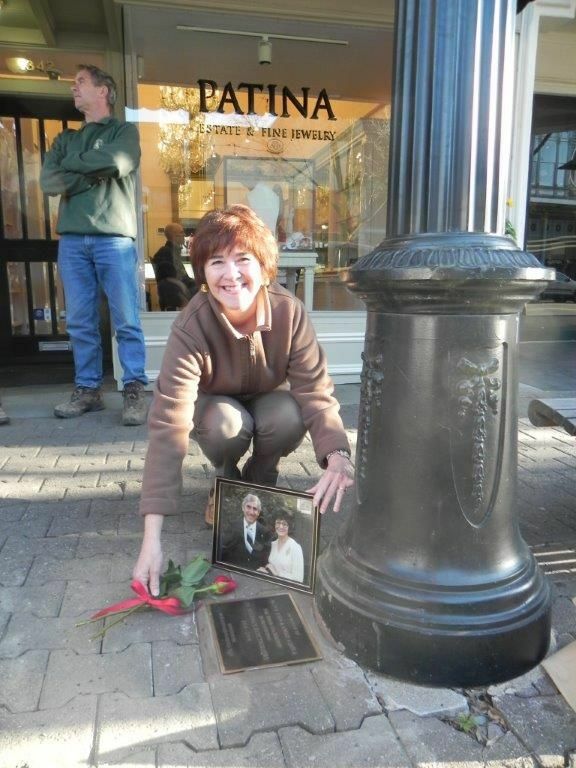 In January 2015, Marilyn Aquila Doss lays a rose at a plaque commemorating her parents’ role in saving St. Helena’s iconic electroliers. An advertisement for the Great Western Power Company of California was published Feb. 24, 1928 in the St. Helena Star. Great Western Power Company promoted using electrical appliances over gas. They also sold electrical appliances in their retail store on Main Street. The sidewalks were thronged with gay promenaders who appeared to care for no better amusement than to note the splendidly gas lit stores standing forth in striking contrast to the “pre-historic” coal oil lamps. And the contrast was striking — a person passing by businesses illuminated by gas and coming suddenly in front of others lit by coal oil could only note the dark and dismal aspect of the latter … The streets themselves presented a most pleasing appearance. The combined light from buildings on either side and from the few street lamps was a feast for the eyes.” Six street lights were provided by the town. The gas company placed gas lights over the bridges at the head and foot of Main Street. Thus began the coming of artificial light to St. Helena. Community life changed forever. The St. Helena Gas Company was founded by leading citizens of the day: Charles Krug, Jacob and Frederick Beringer, W.A.C. Smith, Theron Ink, John Steves and Alexander Badlam (the largest shareholder and Sam Brannan’s nephew). The investors bought the land and gas expert M.G. Elmore installed the equipment. The gas light had the brilliance of 21 candlepower, a light measurement. By 1888, the new incandescent electric lights were available. In January George Henzel visited St. Helena and proposed an electric light project. He wanted to use the Schuyler Electric Light Co. equipment. The city council agreed and gave him a 20-year franchise. No more was heard from him. Lawrence Duckworth brought a representative of the Westinghouse electric light system to town in April 1889 to gauge interest and sign up customers for new electric service. They found many more customers than expected. In May stock was sold at $20 a share with 500 shares in the St. Helena Electric Light & Power Company. “It looks like our town will soon be up with the times” opined the Star. The stockholders were Mr. Newkirk, D.B. Carver, L. Duckworth, L.H. Trainor, Dr. Henry Pond, William Rennie, George Riggins, and Willis Mackinder (publisher of the Star). The equipment was ordered and promised to be operating in 60 days. On June 7 the Star reported that Marr Construction Company began stringing electric wires. They sent W.H. Murphy and Mr. Parkes to do the work. John C. Money built a new building for the electric light company [at rear of Steves Hardware]. A week later the arc dynamo, 10 arc lamps, and 200 incandescent lamps arrived in town. Still missing were the incandescent dynamo and the exciter. The wiring is progressing rapidly. Residents have ordered 300 lamps and the city granted the company a 20-year franchise. By July 26 the dynamos were all in place and the arc was tested this afternoon. “There is no doubt the plant will be a success mechanically and financially,” wrote the Star. On Aug. 1, 1889 electric lights were turned on in all parts of town and were a great surprise to all. The incandescent lamps [bulbs] gave a much brighter and softer light than the gas lamps. The Enterprise Brass Band paraded through the streets. They stopped in front of the St. Helena Electric Light & Power company office to play a few numbers. The Star urges readers not to abandon the St. Helena Gas Company. If they don’t receive income they will shut down soon. The gas will be missed if they shut it off. One day later a huge fire started in the Duckworth & Genung Foundry on Railroad Avenue of suspicious origins. The St. Helena Electric Light & Power Company building adjoining the foundry sustained but a small loss. The firemen worked hard to keep the fire from spreading from the light company building to a stack of wood behind Steves Hardware. Rumor spread that there was dynamite in the Steves warehouse. The company’s arc dynamo was damaged considerably by water, but the incandescent dynamo was unharmed. The switch board, dial, lamps and other equipment had to be replaced. The loss was covered by insurance. By Aug. 9 the insurance money for the fire damage arrived. The arc lights and belts for the machinery were not insured. A new switch board was coming. The company hoped to have the lights back on by Sept. 1. By Nov. 1, the company had so many customers they needed to buy a new steam engine. They sent Messrs. Duckworth and Trainor to San Francisco to buy a new Thomson-Houston 125 horsepower engine. The company was to double its capital stock. But through the spring of 1890 there were not enough subscribers to make a profit for the company. On July 31 the electric light company switched off the power. President Pond told the city council the company ended business. In October the company sold its equipment and shipped it out of town. Thus ended the first electric lights in St. Helena. Dr. George Conner of Dixon visited town in early 1903 with an expert in electric power. St. Helena had 1,500 residents, but no electric service. Dr. Conner requested permission from the city council to erect poles and string wires along the streets for electric lights. Permission was granted. In early May a car load of cedar poles was unloaded at Greenfield’s Lumber Yard. Work on the electric plant was started. In July the city council approved placing 30 incandescent lights on street corners around town and four arc lights on Main Street. St. Helena Gas & Electric Company was incorporated. Directors were Harvy Lewelling, A. Lewelling, George Conner, Mrs. Emma Wyatt Conner, W.O.Wyatt of Winters. Lewelling’s St. Helena Gas company merged into the new company. Snow Mountain Water & Power Company built a new hydroelectric station on the Eel River. Their main lines traversed Mendocino and Sonoma counties. Dr. Conner convinced them and Napa County businessmen that a line into Napa County could be profitable. St. Helena Gas & Electric would distribute the power locally. Surveyors planned the lines from Fulton Road north of Santa Rosa over Spring Mountain to the end of Madrona Avenue in St. Helena. The planned route was down Madrona to Hudson, to Spring Street then to the substation at the south end of Oak Street. The changeover was promised by Dec. 1, 1907, but it took much longer. Napa Valley Electric Company (NVEC) was incorporated in 1907 and gobbled up St. Helena Gas & Electric Company. The company served all of Napa County. A Westinghouse Company representative came to prepare for installation of the three big transformers at the Mitchell & Oak electric substation. Snow Mountain Water & Power lines reached Ukiah in April 1908 and that city was provided with hydropower from the Eel River. Santa Rosa was next. As of April 30, 1909 the line of 17 miles with wood poles was being constructed from Fulton [on River Road, where the substation still stands today]. The wood poles were replaced by steel towers in 1928. Frank Mielenz oversaw construction of our substation. By June 1 the power lines and transformers were installed. On June 12 the juice was switched on and St. Helenans had 24 hour light and power for the first time. The old steam electric plant, which only provided lighting in the evening, stopped operating. The power came to the NVEC substation on Mitchell at 55,000 volts and was distributed to customers at 110 volts. The NVEC also owned the gas works, furnishing gas for lighting and for cooking. The California Railroad Commission regulated electric utilities. The company wanted to close the plant in 1917, but the Railroad Commission denied their request until 1928, when the gas plant closed permanently. It was never profitable, but filled an important need in town. It lasted for 45 years. St. Helena wanted better street lighting on Main Street. In 1913 Napa Valley Electric Co. sold four electroliers to the town for installation on bridges at York Creek in the north and Sulphur Creek in the south. Night watchman turned them on and off. Pleased with the results, the city installed electroliers from bridge to bridge in 1914. In 1921 the NVEC electric plant of 1909 was obsolete and the commission ordered NVEC to upgrade its equipment. The company installed new equipment like that used in large cities. There were two substations in one, as there is a backup in case of a breakdown. NVEC requested permission from the Railroad Commission in 1926 to sell to Great Western Power Company, whose system was already connected to NVEC nine miles south of St. Helena. Permission was granted and in 1929 NVEC was absorbed by Great Western Power Company. Snow Mountain Water & Power was sold to Pacific Gas & Electric (PG&E) the same year. A year later Great Western merged with PG&E, completing the monopoly PG&E has today in much of California. Editor’s Note: Mariam Hansen is research director of the St. Helena Historical Society. She may be reached at shstory@shstory.org. Cpl. Peter Molinari, St. Helena native and World War I soldier, was honored at a meeting of American Legion Post 199 on Nov. 14.